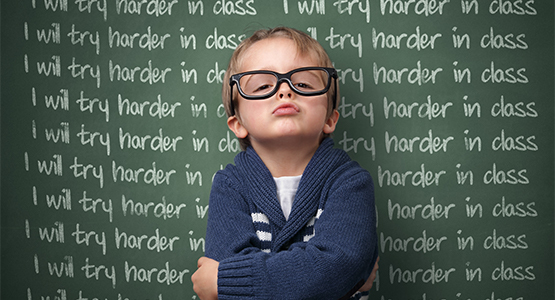 Web-based software to manage and improve student behavior. Make positive change and measure their effects. Electronically manage your discipline process. Allow staff to better coordinate to handle issues. Invest in technology to manage and improve student behavior at your school. Better react to individual incidents. Gain a deeper understanding of behavioral dynamics. Allow staff to coordinate on issues. Streamline the discipline process by making it paperless. Teachers fill out web-forms that appear immediately to administrators. Detention and suspension lists are available to staff. Easily notify parents. Save staff time and get organized. Run reports to understand where and when each type of incident typically occurs. Identify areas prone to trouble and respond proactively to prevent future problems. Have an adult presence there before trouble starts -- you'll almost seem clairvoyant. Web-based application tuned for simplicity. Very easy to learn and use. Even staff with limited computer skill will love it. After implementing an intervention, measure its impact on the incidents that still occur. Do we have fewer, more, or the same? Were the incidents disrupted or did they migrate somewhere else? Powerful reporting tools can give you those answers. Implements sophisticated security to protect confidential data. Allows sharing of information with only authorized individuals -- help staff coordinate on difficult behavioral problems. Don't keep your reports locked in a file drawer. Streamline the discipline process by making it electronic. Save all data in a centralized database. Information is available instantly to all authorized users. 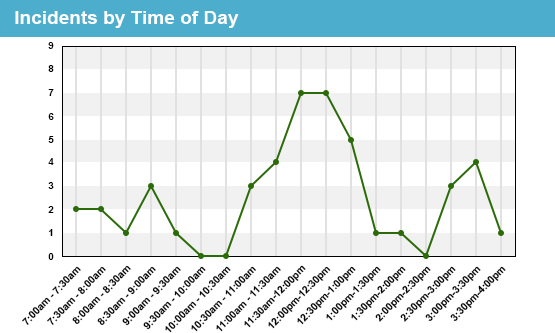 Run sophisticated reports to analyze your data and gain valuable insights. Staff saves time. The discipline process starts with a teacher writing up an incident. They fill out an online form. They either assign a low level consequence (warning, detention, etc) or refer the student to the administration. Once an incident gets referred to the office, the administrator(s) get involved. The administrator has the necessary meetings and assigns an "action" as a consequence for the student -- typically detention, suspension, etc. The parents can be notified by letter/email. Any teachers who'll be missing students in class can also be notified. If multiple discipline administrators exist, one chooses the incident. 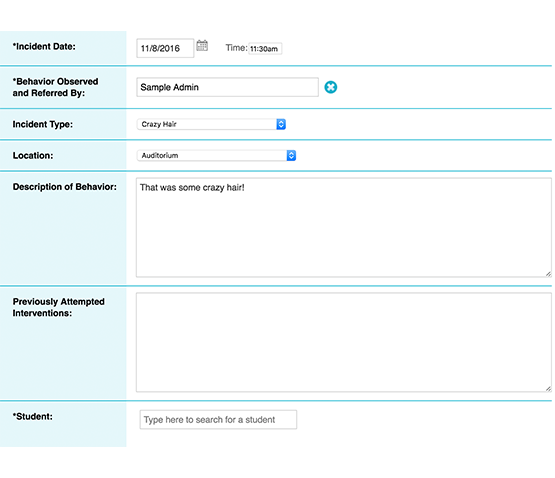 Based upon permission settings, administrators can see each other's incidents -- understanding the context of previous incidents and consequence.Limited information can be shared with teachers based upon confidentiality and permission settings -- letting them know the result of their referral. After consequences are determined, parents can be notified. 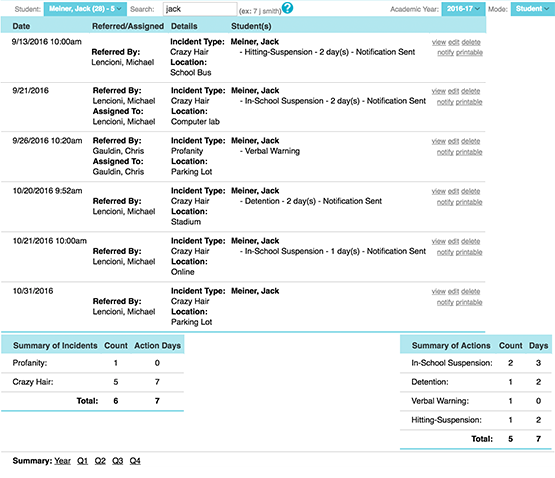 Customizable templates can be used to generate standard letters to formally notify parents of disciplinary actions. Email can also be sent for less severe cases. This saves time and standardizes the process. Since incidents are in a database, reports can be run to determine troublesome times, locations, and types of behavior. Is there a high frequency of smoking in the bathroom after lunch? Understanding behavioral trends allows you to proactively address those issues and positively impact discipline at your school. So if you're having trouble with students smoking the bathroom, maybe an administrator should walk through every day at that time? Proactively implementing positive interventions can interrupt bad behaviorand improve the disciplinary climate at a school. Forewarned is forearmed. Once you've designed interventions, measure their impact. Did it reduce the number/severity of incidents, or just move them elsewhere? Run reports over time to understand the effectiveness of a interventions.View the number/type of incidents for a timeframe. Look at that over time to track the improvement at the school. Each school has it's own unique challenges, and the software needs to adapt to meet a their individual needs. Nearly everything is customizable: locations, incident types, actions (consequence), letter templates, etc. I just love the discipline module! I can generate a report in a couple of seconds and show up to a meeting where the information helps us make timely decisions regarding our students. We've got a better handle on discipline incidents and we've taken actions that have reduced discipline problems at our school. It's absolutely wonderful! We use the discipline logs everyday. We are new to the program this year and found it so easy to learn and use. We've been able to customize the process and include discipline actions that are specific to our school. I just pick and choose the incident, action type, and location from a drop-down menu and that's it. It's a great way to keep discipline records for students.